Colt Guthrie of Stephenville (bottom, center) snags a new baseball cap during Edgefest at Pizza Hut Park in Frisco on Saturday, Oct. 25, 2008. Drummer Blake Dixon (left) of the Mississippi-based band Saving Abel signs an autograph on the arm of Christina Dutcher of Ponder during Edgefest. 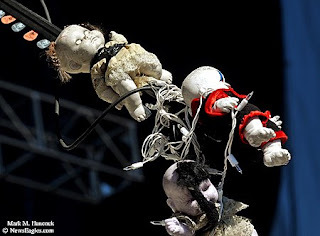 (Above) Painted and dirty baby dolls remain tied to the microphone stand of Shaun Morgan, Seether's front man, during Edgefest. 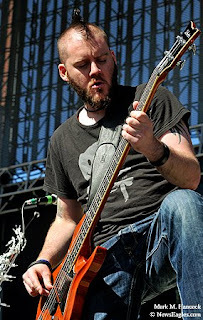 (Left) Dale Stewart of Seether plays bass during an Edgefest. 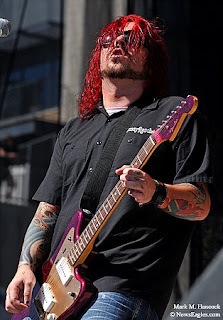 Shaun Morgan of Seether plays guitar at Pizza Hut Park. (Above) A fan crowd surfs during a concert in Frisco. 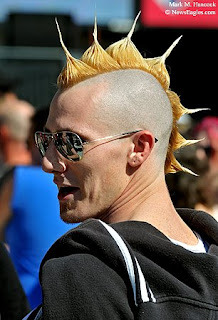 (Right) Austin Gibson of Allen sports a spiked mohawk during Edgefest. 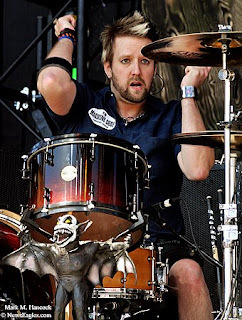 John Humphrey of Seether plays drums during an Edgefest concert at Pizza Hut Park. 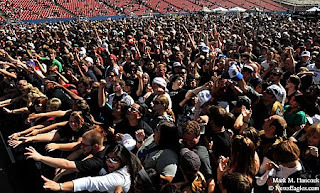 (Above) Fans reach for givaways during Edgefest. 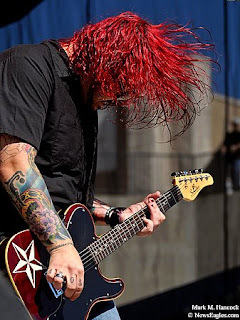 (Left) Shaun Morgan of Seether plays guitar during an Edgefest concert at Pizza Hut Park in Frisco. 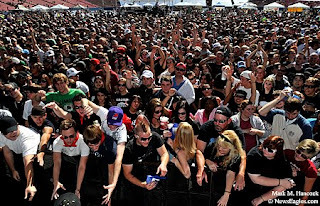 Please read, "Edgefest at Pizza Hut Park not very edgy" by Matt Weitz. 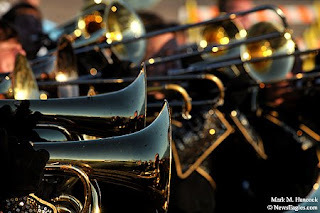 The Plano East Senior High School band gathers in the parking lot before taking the field during the Region 25 UIL Marching Band Contest at Clark Stadium in Plano on Saturday, Oct. 18, 2008. 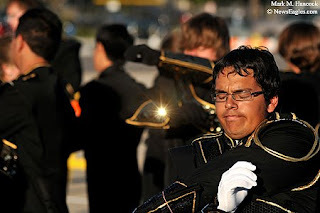 Drum major Tony Gonzales stretches with the band before taking the field. The Plano East Senior High School band warms up at Clark Stadium. 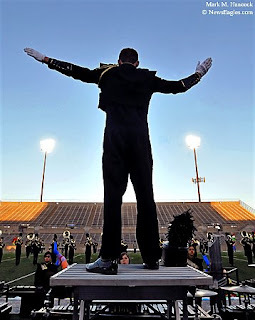 Plano East Senior High School drum major Brandon Howle leads the band during the Region 25 UIL Marching Band Contest in Plano. 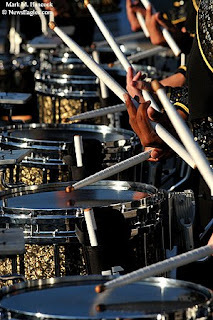 The Plano East Senior High School drum corps perform at Clark Stadium. 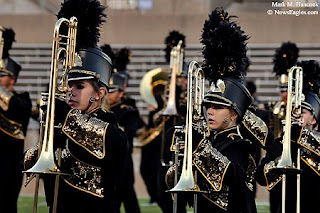 Plano East Senior High School brass players perform during the UIL Marching Band Contest. 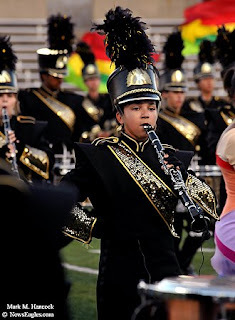 Christie Gurski performs a clarinet solo with the Plano East Senior High School band during the contest at Clark Stadium. 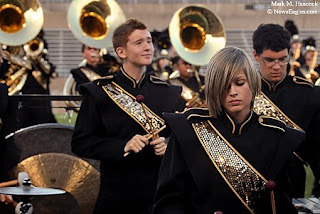 Jesse VanAsdale (lower right) plays the marimba during the UIL Marching Band Contest. 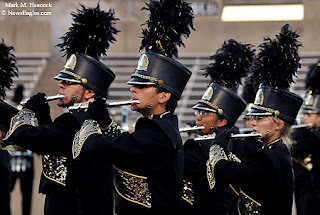 Members of the Plano East Senior High School band perform during the contest in Plano. 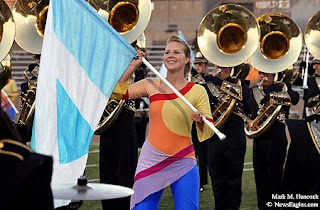 Plano East Senior High School flag corps member Marissa Miller (center) performs with the band during the Region 25 UIL Marching Band Contest at Clark Stadium in Plano. 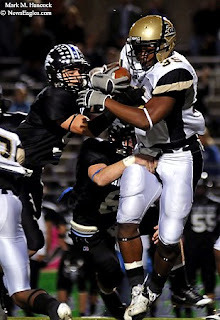 Plano East's D'Lyle Washington (No. 3, left) looks for a hole in Plano West's defense during a high school football game at John Clark Field in Plano on Friday, Oct. 24, 2008. Plano East's D'Lyle Washington (No. 3, center) rams into Plano West's defense during a high school football game at John Clark Field. Plano East's Toben Opurum (No. 35, right) drives into Plano West's defense during a high school football game in Plano. 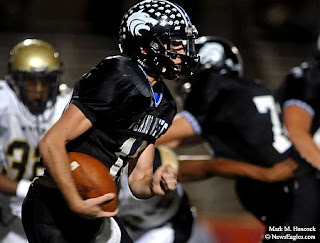 Plano West quarterback Travis Wilson (No. 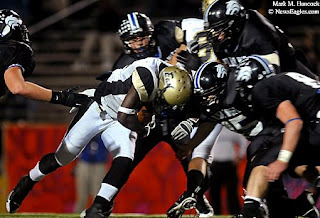 10, center) runs toward Plano East's defense during a high school football game. 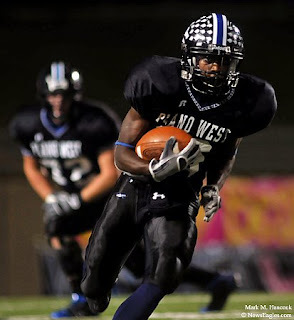 Plano West's Kenny Chatmon (No. 18, right) returns a ball during a high school football game against Plano East. Plano West's Jackson Jeffcoat (No. 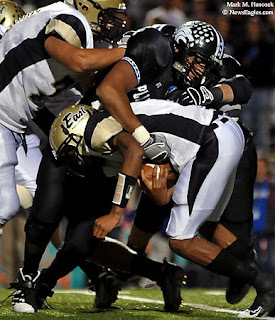 42, top) stops Plano East quarterback Brandon Wesley (bottom) during a high school football game at John Clark Field in Plano. West won 52-14. 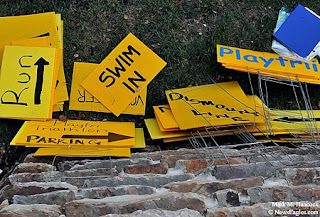 Extra signs remain near the announcers table during the Kids Playtri Triathlon at Stonebridge Ranch Beach and Tennis Club in McKinney on Saturday, Sept. 27, 2008. 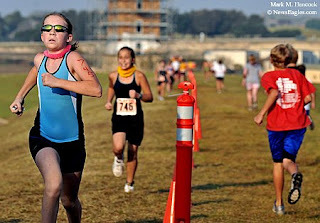 Triathlons are growing in popularity among children and their parents. 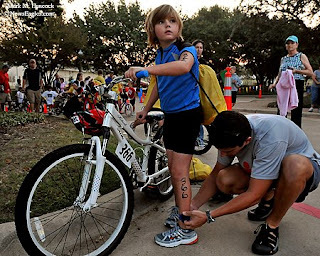 Andrew Watson with Run-Far of Austin prepares timers before the Kids Playtri Triathlon at Stonebridge Ranch Beach and Tennis Club. More than 150 kids registered for the McKinney event. 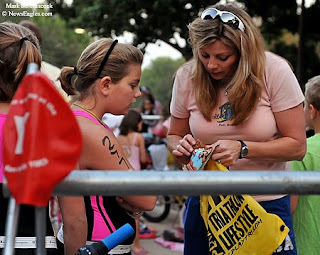 Brian Young (right) places an electronic timing band on 7-year-old daughter, Emi, (center) before the Kids Playtri Triathlon in McKinney. Families prepare equipment in the transition area before the Kids Playtri Triathlon. Abi Young, 10, (left) gets preparation help from her mother, Dee Young, (right) at Stonebridge Ranch Beach and Tennis Club. 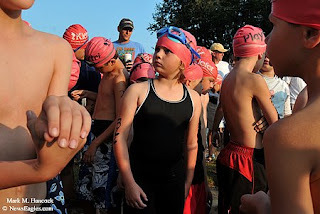 Emi Young, 7, sizes up the competition before the Kids Playtri Triathlon in McKinney. 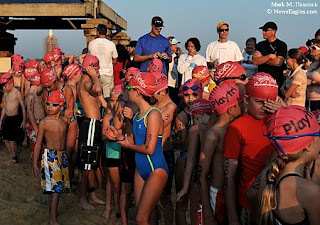 Younger children wait to begin the Kids Playtri Triathlon at Stonebridge Ranch Beach and Tennis Club. 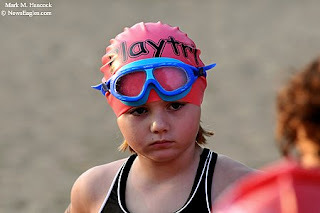 Emi Young, 7, assesses the competition before the Kids Playtri Triathlon. 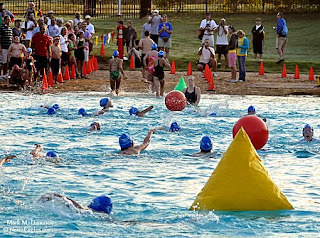 Competitors swim at begin the Kids Playtri Triathlon at Stonebridge Ranch Beach and Tennis Club. Abi Young, 10, removes her goggles and cap as she completes the swimming section of the Kids Playtri Triathlon. 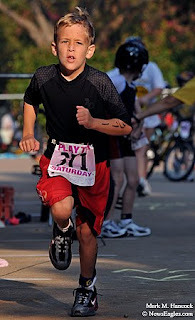 Brett Ross, 7, of Rockwall transitions from cycling to running during the Kids Playtri Triathlon in McKinney. Brittany Stout, 12, of McKinney (left) and Lauren Owen, 12, of Waco (center) sprint to the finish during the Kids Playtri Triathlon. Dee Young (left) gives a kiss to daugher Madi, 9, (right) while hugging Emi, 7, (center) after the Kids Playtri Triathlon at Stonebridge Ranch Beach and Tennis Club in McKinney. 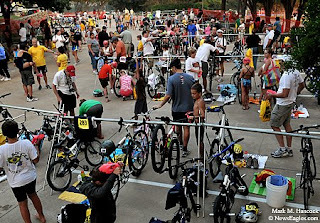 Please read, "Triathlons for kids are fun alternatives to team sports" by Debbie Fetterman. 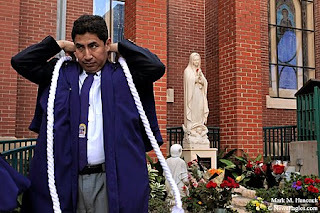 Peruvian Francisco Escobedo prepares for his role in the annual El Senor De Los Milagros mass at Our Lady of Guadalupe Sanctuary in Dallas on Sunday, Oct. 19, 2008. The event brings together many Catholic Peruvians in the area. 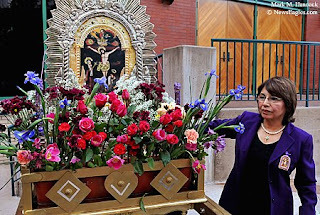 Zarela Hamill, Peruvian and event founder, prepares flowers in an alter before the annual Peruvian community's El Senor De Los Milagros mass at Our Lady of Guadalupe Sanctuary. Hamill founded the event in 1992. 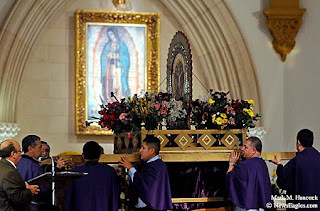 An alter leads the processional during the annual Peruvian community's El Senor De Los Milagros mass at Our Lady of Guadalupe Sanctuary. 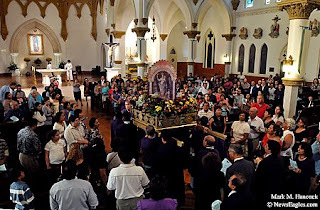 Bearers carry an alter into the cathedral during the annual Peruvian community's El Senor De Los Milagros mass in Dallas. 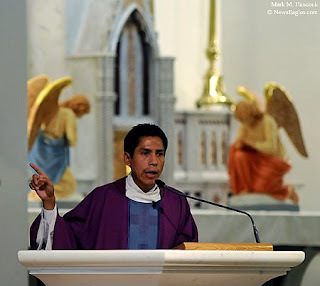 Father Ciro Quispe gives a sermon during the annual Peruvian community's El Senor De Los Milagros mass at Our Lady of Guadalupe Sanctuary in Dallas. "Peruanos celebran devoción religiosa" (translated) by Patricia Estrada. 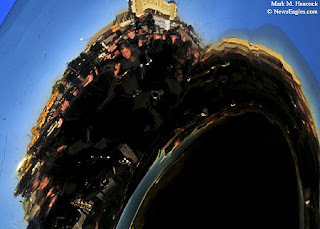 Tim Hussin was born in Palm Harbor, Florida in 1985. He is currently a freelance photojournalist. 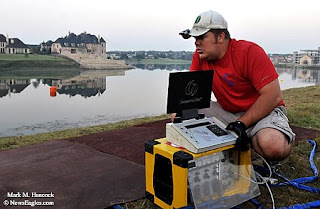 He has a Bachelor of Arts degree in Photojournalism from the University of Florida. He has interned at The Rocky Mountain News, The Deseret Morning News, Monroe Evening News and The Gainesville Sun. In 2008, he won the College Photographer of the Year and was a semi-finalist for the Hearst Journalism Awards. He has also won other awards from the CPOY, Hearst Journalism Awards Program, the Society of Professional Journalists (SPJ), the National Press Photographers Association (NPPA), the Michigan Press Photographers Association (MPPA) and the Photo Imaging Education Association (PIEA). He is currently the 2008 NPPA student clip contest point leader. He participated in a project about the sponge industry in the Bahamas as well as a Study Abroad project at an historic art house in Berlin, Germany. Recently, he covered the Democratic National Convention in Denver, Colo. and the separation of parents from children at the Fundamentalist Church of Jesus Christ of Latter-day Saints in Eldorado, Texas. Additional images can be seen on his blog, his Web site, and his Flickr stream. Please read his interview parts A, B and C.
Bulldogs' Brenden James (No. 4, left) turns the ball as Cyclones' goal keeper Augustine Segura (No. 13, center) and Juan Ventura (No. 11, right) move to defend during a Garland Soccer Association game at Winters Soccer Complex in Garland on Saturday, Oct. 11, 2008. Cyclones' Carlos Perez (No. 20, left) and Bulldogs' Alberto Casares (No. 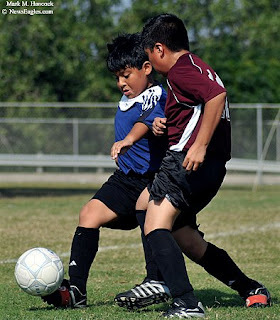 11, right) both kick the ball during a soccer game at Winters Soccer Complex. Cyclones' Juan Ventura (No. 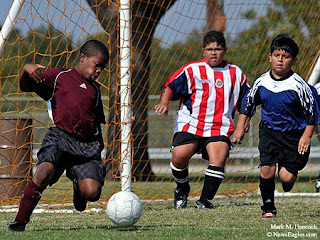 11, left) kicks the ball away from Bulldogs' Alberto Casares (No. 11, right) during a soccer game in. Cyclones' Fernando Martinez (No. 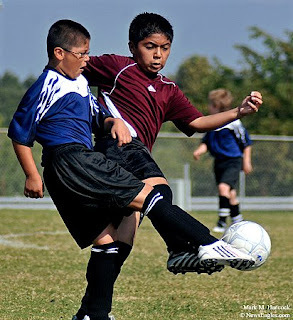 3, left) and Bulldogs' Osman Reyes (No. 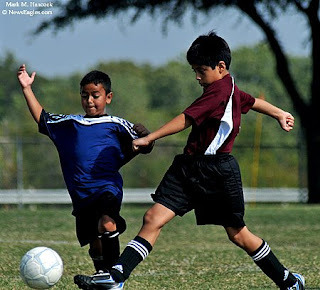 9, right) battle for the ball during a Garland Soccer Association game at Winters Soccer Complex in Garland. In 2005, 2006 and 2007 we tried to ascertain which colleges are best for PJ students. My answer is always the same: The university doesn't make the best PJs. The best PJs make the most of their time at university. This fact was proven when the College Photographers of the Year Casey Templeton and Rick Gershon were both lone wolves from their universities. Tim Hussin, the 2008 College Photographer of the Year, is also a lone wolf from the University of Florida. We now have four years of data to show us benefit-for-investment trends at different universities. Let's use the information we have and draw a few conclusions. When looking at the winners list, let's ignore who won gold, silver, bronze and honorable mention. Instead, we'll look at how many individuals from different universities got any awards. Of these winners, we'll eliminate the universities with only one winner (no matter how many awards were won) and eliminate the redundancies. Again, what remains is a solid guess at the quality of the PJ education at different universities. If nothing else, it shows a consistent ability to teach students to shoot and select quality images for competition. Western Kentucky gained the most ground this year and picked up three. San Francisco State increased awards by a third. Ohio held the lead and increased its total by one. Syracuse also picked up one. The University of North Carolina was stable while the University of Missouri and Brooks both lost two. Loyalist College and Southern Illinois University are new on the leader board this year while the University of Nebraska vanished. As stated before, universities with strong programs draw strong students. These students are frequently as demanding on one another as they are on themselves. The top two PJ universities continue to impress. Both have remained at the top of the leader board for the last four years. This means their students are producing consistently high-quality work from year to year. Meanwhile, one driven PJ can still take all the marbles without cohorts. Tim Hussin took the portfolio win. He also accumulated the most overall wins. What makes him so dangerous to other collegiate PJs is he accomplished this with still images and mixed media. Hussin's skills match what's happening on the pro side of this biz. He won awards in Spot News, Feature, Domestic Picture Story, Still Image Audio Story, Video/Mixed Media Photo Story and Portfolio. Unlike last year's multimedia dominance by Ohio and UNC, awards were won by many schools. Ohio University, University of Florida, University of Missouri, University of North Carolina at Chapel Hill and Western Kentucky University all earned awards. This means these universities, have a grip on industry demands. The College Photographer Of the Year is the shooter with the best portfolio. This system is similar to the Pictures Of the Year (POYi) awards. Meanwhile, the NPPA regional photographer of the year is determined by points. This point system shows consistent commitment to excellence and competition throughout the year. Since we have four years of data now, we can crunch some numbers. Editors who get resume packages from these folks should take a serious look-see at the packages. These numbers indicate a consistent ability to perform at a high level in multiple categories over time. The folks still in college will drive up their numbers in the next few years. Those who graduated three years ago may not have done as well on this list as they would have if I had the whole data set. Nonetheless, the top 10 above are all strong recruits for newspapers and magazines. Of these, we again see Ohio continues to be the top school. Sarah Nour poses for a portrait with Howard, her 3-year-old Teacup Maltese, at her boyfriend's home in Little Elm on Thursday, Oct. 16, 2008. Nour left a corporate job to teach children in the Dallas ISD. Sarah Nour poses for a portrait with Howard, her Teacup Maltese, at her boyfriend's home. She was laid off with hundreds of other district employees due to the DISD's $84 million budget deficit. Sarah Nour watches television at her boyfriend's home in Little Elm. She cried with her first-grade students after she said good bye. Now, she's unemployed. Please read, "In her own words," the personal report of Maple Lawn Elementary first-grade teacher Sarah Nour, 26.